Due to the large amount of questions I receive, I’ve decided to start a Frequently Asked Questions (FAQ) page here. Every time I receive a reader question, there’s a strong possibility that it’s been asked before. In fact, 62% of the questions I receive are some variation of a small number of commonly asked questions. Whilst I love to receive any and all correspondence from readers of Filmmaking Lifestyle, I thought I’d create this page as a signpost to send visitors who ask a regularly asked question. This FAQ will be updated from time to time. I’m also going to include some lesser-asked questions that I still feel belong on a FAQ page like this. Am I Too Young/Old To Start a Video Production Company? No. Not at all! If you have passion, commitment and a willingness to learn, then you’re never too old (or young) to start anything. This is one of the questions I get asked the most, and it always makes me a little saddened when I read it. Some people will go through life never pulling the trigger on their dreams, as they falsely believe that they’re not the right age to do something. Video production is for all ages. You can appeal to certain sub-industries more based on your age, sure. For example, extreme sports videography when you’re a younger person. Or corporate based videography when you’re a little older. Overall, I’ve seen people of all ages succeed in the video production industry. So it’s never too late (or early) to get started! Don’t I need a load of money to start a Video Production Company? You don’t need to buy tonnes of expensive gear. Renting gear is a common practice with big established video production companies, so why not beginners, too? You don’t need offices. Get work first! When you grow bigger and scale up, you can think about offices. To pay to be registered with lots of business bureaus (and other organizations). Most of these are a racket. Again, this is a really commonly question question, and I’m always kinda surprised that people would think like this. One of the biggest issues with this is people thinking they need an office. When you’re starting out, there’s no need for an office. If it’s just you on your own, or you and a friend running the business, there’s no point is paying the large overheads and costs for having an office. Unless the office is in your house, then forget it! For now. I’m a full-time video production owner and entrepreneur who runs a number of different businesses. I’ve been on the same journey that you’re probably on right now. I only make recommendations of things to do (and tools to use) that I think my readers will benefit from. But Don’t I need a tonne of expensive gear to start my video production company? Nope. As mentioned in an earlier question, gear can be rented early on. You don’t yet know if this is for you. Why shell out lots of money if it’s just a passing interest for you? You don’t yet know what gear you really need for your video production sub-industry and location. You’ll learn this as you go. Don’t be one of those annoying folks who goes out and buys everything when they get into something new. You know the type, they’ll get into skiing (or golf) and next thing you know their entire garage is full of thousands of dollars worth of equipment that they’ll only use once. You can buy a camera to own in order to get used to using it. I cover what video camera to buy extensively here. Other than that, stick with renting (or borrowing) gear when you’re starting out and on a budget. I don’t have any filmmaking skills. What do I do? 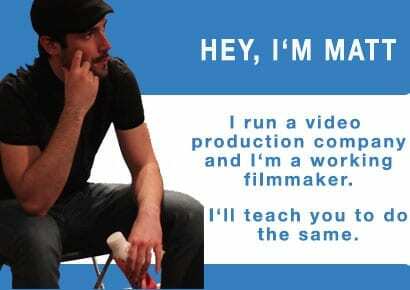 Firstly, if you don’t have any filmmaking skills, I suggest you go out and get some. As you’d be running a poor video production company if you don’t have any filmmaking knowledge. That said, some people do run video production companies with zero filmmaking background. They’re business people who either employ filmmakers or outsource the work to experienced professionals. They’re people running this purely as a business and may or may not have an interest in film. But for the most part, people reading this won’t fit into the bracket described in the paragraph above. You’ll be surprised how many people ask this question. A lot of the time, it’s just a lack of confidence or anxiety holding you back. With that said, Filmmaking Lifestyle teaches mostly the business and marketing parts of the video production business (with some exceptions around the site). I didn’t want to make a site that covered this ground, as it’s covered elsewhere really well already. I’d also be remiss to point out that if there’s enough interest, I might start publishing filmmaking skill based content. I do get asked filmmaking technique/fundamentals questions a lot. We do have a number of articles around the site that cover this, although it isn’t the central theme of the site. Whilst it’s not the stated remit of Filmmaking Lifestyle, it’s not something I’ve ruled out offering in the future. Can I do this as a hobby, rather than starting a full-time business? Sure! I’ve encouraged some people just to stick with this as a hobby in the past, rather than trying to go pro. If your passion and commitment doesn’t mesh with running a video production company longterm, then it’s better to see where you can go with other interests. Taking up filmmaking and video production as a hobby (and not a career) is totally cool and many people do just that.